The similarities are striking. The states that judge the punishment to be too harsh, the blue states in ESPN’s map, align very strongly with red states in the presidential map. Similarly, the green (Too lenient) and red (Just right) states align very closely with the blue states in the presidential election map. All six of the green states voted for Obama in the last election with the exception of South Dakota. Of the red states in the ESPN map only Montana, North Dakota West Virginia went for McCain in 2008. 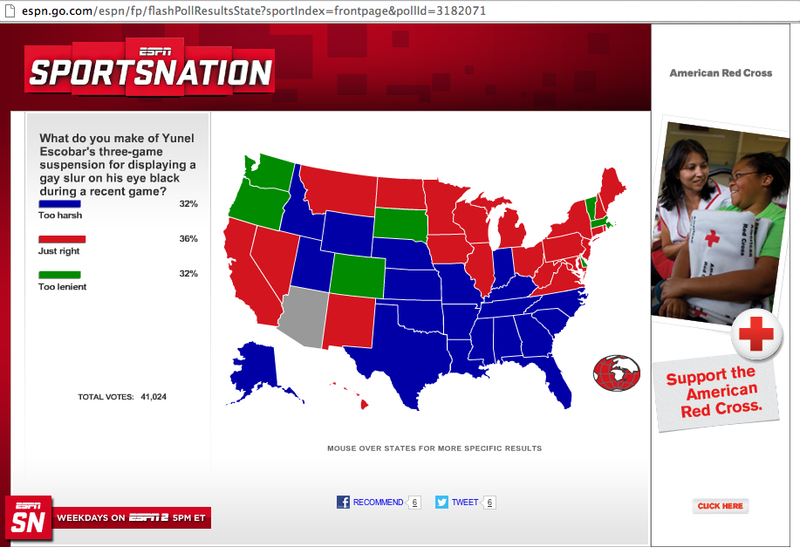 Likewise, of the blue states in the ESPN map only Indiana, North Carolina, and Florida went for Obama. Finally, here is a two by two table with a break down of the relationship between Yunel Escobar opinions and presidential states. (The p-value for the fisher test of independence between rows and columns is 8.213e-07). So, it seems there is a significant association between how people feel about Yunel Escobar’s suspension for using a gay slur and how that state voted in the 2008 presidential election. Posted on September 18, 2012, in Baseball, Politics, Sampling, Sports, Surveys. Bookmark the permalink. 2 Comments. Noticed that too and did a search to see if anyone else did. Good post. Thanks. 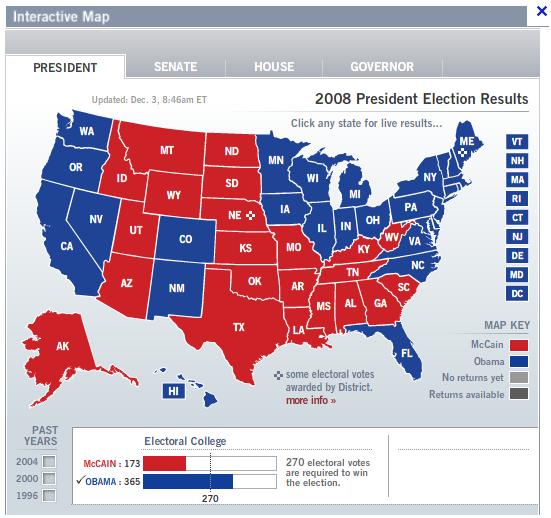 And it looks like the 2012 predicted electoral map is even closer than the 2008 electoral map.